Late last month I wrote about attending the Palabra Pura event on Paseo Boricua, which featured a night of poetry read by both fledgling scribblers and master wordsmiths, and hosted by our friends at the Guild Literary Complex, the center at the center of Chicago’s literary scene. I was really impressed with the work the Guild is doing and their commitment to elevating the voices of both budding writers and seasoned poets alike. But February’s event was just the beginning. This year the Guild has joined forces with Columbia College Chicago’s Department of Creative Writing for the school’s Story Week Festival of Writers, celebrating its 18th anniversary this week. [A] city is more than its architecture or its public spaces or its infrastructure. Above all, a city is its people and the stories, real and imagined, that through which they tell their lives, their histories, their cultures, their relationships, and their place in the world. Stories define our identities, mark us as members of a community (or our many communities), and help us find meaning in our lives. They express our hopes, fears, desires, and disappointments, individually and collectively. Our shared stories shape our understanding of the city of which we are a part and help us see the place of that community in a wider social and historical context. Stories demarcate our territory and our differences, one from another, but they also have the potential for promoting understanding among diverse populations, for helping us cross the borders that divide us (especially in this most segregated of American cities), and for creating a more unified sense of purpose and hope for our urban landscape. We are then, above all, a city of words. And in this year’s Story Week, we celebrate the power of urban stories to foster a better future through the manifold visions that writers, performers, filmmakers, and other artists appearing at this year’s festival will share with us. I don’t know about you, but that tickles my lust for the literary. And the Guild knows just how to satisfy. They kick off their events for Story Week this evening with a discussion at the Harold Washington Library with Cristina García, the Habanera author of King of Cuba, a book dealing with one Cuban’s obsession with killing the aged dictator of his country — all entirely fictional, of course. Doors open at 6. Tomorrow evening the Guild hosts its monthly Palabra Pura event (third Wednesday of every month), but this month’s Palabra Pura is special. 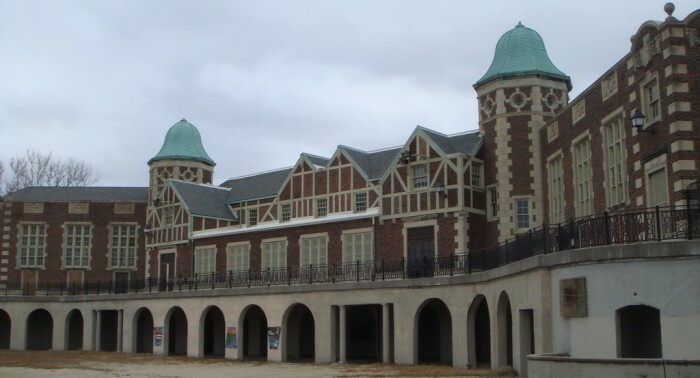 Unlike the others held at La Bruquena, tomorrow’s event will be at Humboldt Park’s historic Field House. I never thought I’d say this, but thanks, CPD! The festivities begin at 5 p.m. with “Translation Matters,” a discussion featuring panelists Cristina Garcia; Kolin Jordan, translator for 7Vientos; Valeria Luiselli, author of Faces in the Crowd and Sidewalks; Achy Obejas, journalist and author of This is What Happened in Our Other Life. The discussion will be facilitated by by Susan Harris, editorial director of Words Without Borders. “Night of Novels,” for those of you who failed Spanish I, will feature the young Mexico City-born author Valeria Luiselli, whose work has received international acclaim — and whose artist profile by Gozamos will be published soon. She’s joined by Raúl Dorantes and Fernando Olszanski, and all three authors will be reading their Spanish-language works with English supertitles, which the Guild is promoting as “a truly bilingual experience.” The host for the night will be Juana Iris Goergen, a Puerto Rican poet and professor of Latin American/U.S. Latino literature at DePaul University, with music by Bianca Lisa Araujo. Then, on Thursday, Achy Obejas (recently profiled by Gozamos) hosts “Literary Rock & Roll: a Tribute to David Hernandez with Street Sounds,” celebrating the life and work of “the city’s unofficial poet laureate,” who died a little over a year ago. Streets Sounds, the jazz fusion ensemble he co-founded, will provide the soundtrack for the event, as Eduardo Arocho, Marta Collazo and Carlos Cumpián take to the stage to read some of Hernández’s singular verses. In addition to the exciting programs the Guild has organized for Story Week, as if they felt they weren’t doing enough to foster a love for literature in Chicago, all of the events I’ve mentioned are FREE — as in gratis, as in free.99, as in #thebestthingsinlifearefree. Who knew Chicago was such a literary garden? Well, I guess the gardeners at the Guild have been saying so all along. Gozamos principally an arts & culture website, so the fact that you’re even reading this means you’re a fan of this stuff. If you want to support Chicago’s literary scene, especially its Latino literary scene, check out these events put together by the good people at the Guild Literary Complex. It’s important work, and better still, it’s good for the soul. As always, keep reading. And to my fellow scribes and poets, write on!